When you’re considering what kind of look you want in a fence, the choices can be overwhelming. Apple Fence Company in Austin can help you narrow it down, choosing a fence that will provide you the security and the design that you prefer. Wrought iron fencing may be the right choice for you—and if it is, you have options! When you’re looking at wrought iron fencing, you will encounter a couple of different types. The first type is the flat rail iron fence design, which has two rails without pickets extending from the top and bottom of the fence. Picture perfect rectangles of wrought iron fencing, extending in a line across your yard. This clean design reflects a relatively simple style of construction, which may be the perfect accompaniment to your home’s façade. The flat rail iron fence design option offers security and protection for business owners at a much lower price than traditional security fence options. Around Central Texas, you may see these types of designs surrounding pools or apartment and condo communities. One of the reasons why wrought iron fencing is attractive to both home and business owners is because of its durability—they are very hard to damage and fairly easy to maintain, with less of the upkeep that comes with a wooden fence and a better aesthetic than a chain link fence. They work well to keep a property safe, because they are also tremendously difficult to climb. These reasons, together with the price, make the flat rail iron fence design an impressive option for your home or business. 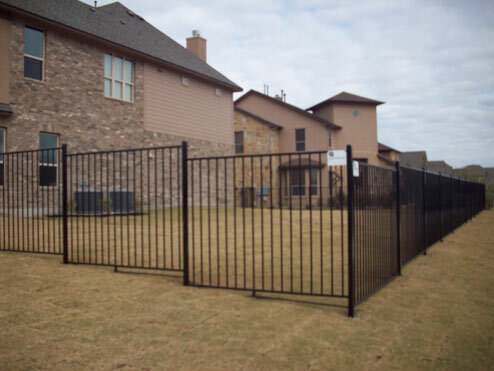 Give our Leander fence company a call for projects in the Austin Metro area. We’ll put together a free estimate for your job and give you the benefit of our years of expertise in the fencing industry.